Fig. 1: Spectral display of AM signal at 100% mod. In all the Icom DSP-based HF transceivers, the transmit audio is fed via the speech amplifier to the analogue side of the ADC. The signal path from the MIC socket incorporates a high-pass filter which cuts off at around 100 Hz. This filter can be bypassed by driving ACC (1) Pin 4 or the S/P-DIF input. The ADC generates a digital bitstream (linear PCM) which is processed by the DSP. The DSP performs all modulation tasks. In SSB mode, the DSP models a phasing-type (I/Q) SSB generator, and produces a mathematically-perfect USB or LSB signal. The unwanted sideband is suppressed by precise phase cancellation. Unlike the case of an analogue phasing exciter of the 1950's, the phase cancellation is virtually complete, and is independent of modulating frequency. No carrier is generated in SSB mode. I suspect that in AM mode, the upper and lower sidebands are added in-phase, as opposed to the cancellation of the undesired sideband in SSB mode. As this addition is frequency-independent, the modulation process will generate a mathematically-perfect AM signal. The amplitude relationship of the carrier and sidebands is always correct. The digital bitstream leaving the DSP is fed to the DAC. The 36 kHz analogue transmit IF output of the DAC is up-converted and amplified to the required transmit power level by a chain of mixers and linear amplifiers. The transmitted occupied bandwidth (TOBW) in all modes is limited by the digital IF filter process in the DSP. For SSB, the maximum TOBW is 2.8 kHz at -6 dB; the maximum for AM is twice that. As these limits are hard-coded in the DSP ROM, they are not user-changeable. The widest transmit AF response which can be obtained is approx. 50 Hz to 2.9 kHz at -6 dB, assuming that the transmit audio feed is connected to ACC(1) pin 4 (or S/P-DIF on the IC-7800). If properly adjusted, the IC-7800 or IC-756Pro/Pro2/Pro3 should produce a smooth, clean-sounding AM signal (within the constraints of the allowable TOBW). Modern AM broadcast transmitters employ a similar low-level digital modulation scheme followed by linear RF amplification. "Big Iron" (plate-modulated Class-C) appears to have become a luxury that few, if any, can afford any longer. An SSB transmitter is peak-power-limited (at 200W for the case of the IC-7800, and 100W for the IC-756Pro series). For this reason, and because the PEP of an AM signal at 100% modulation is 6 dB above resting carrier, the resting-carrier output of the 7800 must be set to 50W max. The corresponding setting for the 756Pro series is 25W. Exceeding this output will cause the radio's ALC to level the output at 200W for the IC-7800 (or 100W for the Pro series) on voice peaks, leading to carrier starvation. The low-frequency end of the baseband should also be carefully equalised to prevent the significantly higher energy in the low end of the speech-band from "robbing" transmitter power away from the midrange. Excessive bass-boost should be avoided; a good starting point is the default WIDE setting (100 Hz at -6 dB) with Bass = 0 or -1 dB. When driving a linear amplifier, the ALC* should first be set to limit the output to the CW rating for that amplifier. Then, the exciter's resting-carrier output must be set to a level which will drive the amplifier to no more than one-quarter of its rated output (e.g. 250W for a 1 kW amplifier). The transmitted signal should be checked with an oscilloscope to ensure that flat-topping does not occur on voice peaks. I am not concerned about "downward modulation" , as I do not accept the use of an average-reading power meter alone as a valid means of setting up an AM transmitter with low-level modulation and linear RF amplification. Between its ballistics and the fact that it is average-reading, this type of meter will not yield an accurate peak reading. One can set resting-carrier output using the Bird 43 meter; to adjust the modulation level and determine PEP, an oscilloscope is required. 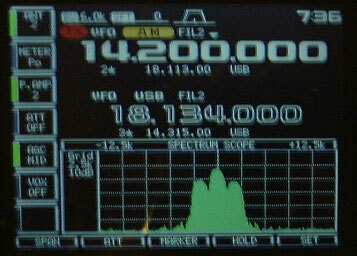 An RF spectrum analyser is a big help if available. The 756Pro series, and the 7800, have a built-in mini-spectrum analyser with which the operator can set resting-carrier and modulation levels very accurately. Here is a procedure for measuring PEP using a Bird 43 (or equivalent) and an oscilloscope. The issue of "downward modulation" is a complex one. I have observed on my IC-756Pro2 and Pro3 that if I apply a 1 kHz test tone for 90% modulation, the reading on the Bird 43 rises by approx. 35%, which is as expected. If I say a prolonged "Five!" into the mic, the meter reading drops. This behaviour does not indicate a fault in the transceiver or amplifier; it is simply the nature of the beast. What is interesting is that the spectrum scope shows no decrease in carrier amplitude in the first case, but does indicate a 2 to 3 dB drop in carrier amplitude on voice peaks in the second case. This is doubtless due to the increased sideband energy at low modulating frequencies "robbing" power from the carrier. (The transmitter being peak-limited at 100W, its ALC will hold the power budget at 100W PEP.) Hence my previous reference to the need for careful equalisation, especially at the low end. After setting up as described in the article, I took a look at the modulation envelope with an oscilloscope, and at the carrier/sideband relationships with a spectrum analyser. These tests confirmed the information presented on the radio's spectrum scope. Bottom line: I am confident that if an IC-756Pro-series radio, or an IC-7800, is set up for AM using the spectrum scope as described here and in the link below, it will produce an excellent AM signal. *In the case of an older amplifier not fitted with an ALC line, the operator should initially "load up" for rated CW output. Link to "Note on AM operation with the IC-756Pro or Pro II"
Copyright © 2005 A. Farson VA7OJ/AB4OJ (including images). All rights reserved.